It was the PERFECT November day: golden foliage and the crisp smell of fall surrounding us and after SO long of hearing about "the pretty part of Alsace" we were heading there. Some history: Pyk's fam is originally from Alsace and his grandparents are still there. The few times we've been there before it's literally rained the. whole. time. So, when he told me he'd like to spend his ONLY weekend off from rugby since September in Alsace visiting his grandparents, instead of in Italy on the Almafi coast as we originally planned, I was less than thrilled. Though that was totally the spoiled travel part of Katie aching, the family part of me was like "Hell yes, I love his grandparents." Because I do. They're awesome and have funny Alsatian accents and love drinking beer. Right up my ally. Okay, back to Alsace and that PERFECT fall day. We're here for four days, at least half of which will be spent hanging out with his family in their village, hopping from a cousins house, to an aunts house, to a great uncle's house, to a grandparents house.. at all of which you drink beer and have snacks or full blown meals. It's a miracle we don't roll home like the blueberry kid from Charlie and the Chocolate Factory, to be quite honest. Strategically, we planned our two days where we'll travel around the weather. Thursday would be the nicest so it's the day we decided to take on our day trip and holy guacamole I'm so glad we did. During the last 20 minutes of the hour drive south we were surrounded by blue skies, tiny puffy clouds, the Vosges mountain range, and VINEYARDS. And all of them a golden yellow and perfectly autumn-aged for our viewing pleasure. To say the views driving were spectacular is an understatement. I honestly cannot remember the last time I saw French autumnal landscapes so stunning. Probably never. 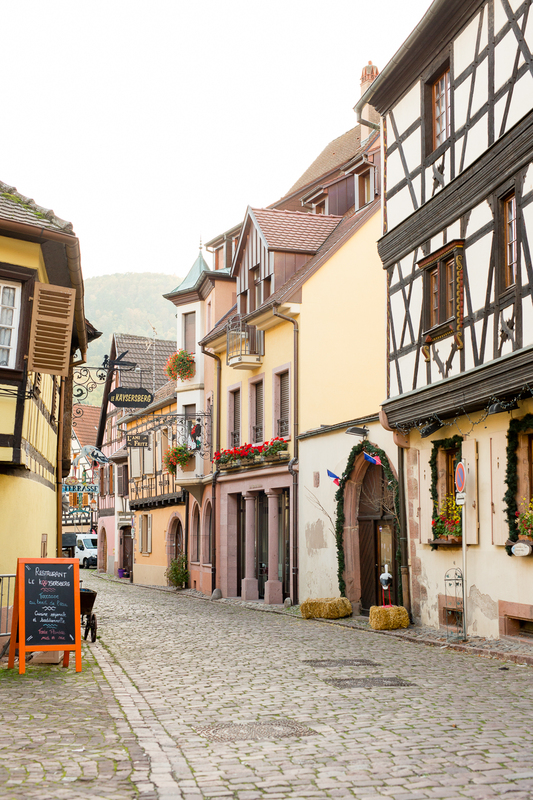 INSIDER TIP: Head to Alsace in the Fall. Yes, you arrive before the craziness/fun of the Christmas markets but it's absolutely countered by the incredible landscape. Note: We had a car for this whole day which I'd totally recommend. Traffic was nonexistent and parking was about 3 euros for 2 hours wherever we went. So, we started in Ribeauvillé, easily parking and then walking into the center of the village. It was super cute. We spent about an hour walking around and during that time got a bretzel from a local street vendor that had yummy bakery smells coming out of it. (Yes, Bretzel, pretzel is apparently not the authentic spelling, who knew!) The trick to these little towns when you have no idea where to get good food/drink or local snacks is to follow your nose. If good smells are coming from a bakery, most likely you're getting fresh products! 1. The "Quartier Pittoresque" aka the picturesc neighborhood, which was totally not a neighborhood but a cute street that definitely lived up to it's name. Loosely translated it says, "The opening hour depends on how many beers our staff drank the night before". I applaud a bar that is THAT sold on it's beer and atmosphere that the staff joins in the fun too. When you get here you realize at once that this village is a much bigger tourist attraction. There were a few tourist groups but not so many to ruin your day. The whole town is on an incline and has pretty cobble stoned streets and incredibly beautiful architecture everywhere you turn. There are a few shops selling traditional Alsatian things which was nice to see. There are a few restaurants/bars (that fill up QUICK for lunch) and the most BEAUTIFUL Christmas shop that I've ever seen. Honestly, it's Christmas heaven. Buddy the Elf would live there in a heartbeat. All of the restaurants that we tried were totally packed.. We were 4 people so maybe a couple would have more luck but a family would DEFINITELY have to get there earlier. We got there around 1:30pm. We ended up finding a restaurant that honestly, was a weird experience. It went against every foodie grain in my body: no one inside already eating, nothing cooking so you couldn't smell the savors, and a menu totally different than what is readily available locally. But we were hungry and the grandparents lead us in. In the end I had a small salad- Forgettable. I'd definitely recommend to try some of the bar/restaurants on the main street. It's a small village so there aren't many but damn did it smell good when you walked into them... And all of them were serving super limited menus of classic Alsatian food. I'm still bummed we didn't get into any of them. After out weird lunch we headed over to the Christmas shop and then to the car.. Off to.. I literally thought that Belle was going to pop out of one of the houses here. IT WAS SO FREAKING CUTE. Definitely my favorite of the three villages other than the Christmas shop part. This village was SO calm, so quaint, had this lovely little stream going through it, and had adorable fountains and magnificent views of the surrounding vineyards. There's a beautiful hotel and a 2 Michelin star restaurant in the center. I honestly am so so sad to have only been there for the day and not have the chance to stay there. It's definitely on my list to go back to. I'd absolutely love to spend the day in this little town, walking around, hiking up the mountain and eating yummy Alsatian food. To be honest, I had high hopes for Colmar. Everyone who's been to Alsace always talks about how amazing Colmar is. Honestly, sure, I see where they're coming from but from our little promenade in the city, I'm hesitant to give too much praise. While it has absolutely STUNNING buildings, a beautiful church and even a little Venice that was super charming.. I didn't feel that same Alsatian village feel as in the other villages we'd visited. I mean, they have a Zara and an H&M... That should say enough. No French village would have those. It's more of a city and I think wasn't at all what I was searching for in the middle of this beautiful part of France. Though take what I say about Colmar with a grain of salt.. it was also the end of the day, we were cold and tired and I fell so deeply in love with Riquewihr and Kaysersberg that it was hard to rival. What I think we'll have to do next time we're here is stay a night or two in that gorgeous little hotel in Kaysersberg and during those days spend a few more hours in Colmar and give it another chance. All in all, we had an amazing day.. We walked about 5 or 6 miles and discovered a part of this beautiful region under the golden autumnal sun.. If that's not perfect I'm not sure what is.